A Day of Design Discussion | whitespace.
. Published on October 14, 2014 . This September a group of designers, recent hires, and principals braved the Louisiana heat and knocked elbows in Gould Evans’ newest studio: New Orleans. Perched over the ever active Magazine Street, sounds of the town wafted into the space as those in attendance huddled around recent projects and lessons learned. In recent years this has become an annual endeavor for the firm: to gather together a rotating group of designers (we call it the dGroup) and to share knowledge and experience between six regional studios. This time around we were excited to be joined by guests from the Tulane Architecture School including John Klingman, Cordula Roser-Gray, Byron J. Mouton, and Judith Kinnard. And talk we did. Each studio led a topic-based discussion, with Kansas City first up to bat. The KC studio presented recent schematic design experience in office and workplace. 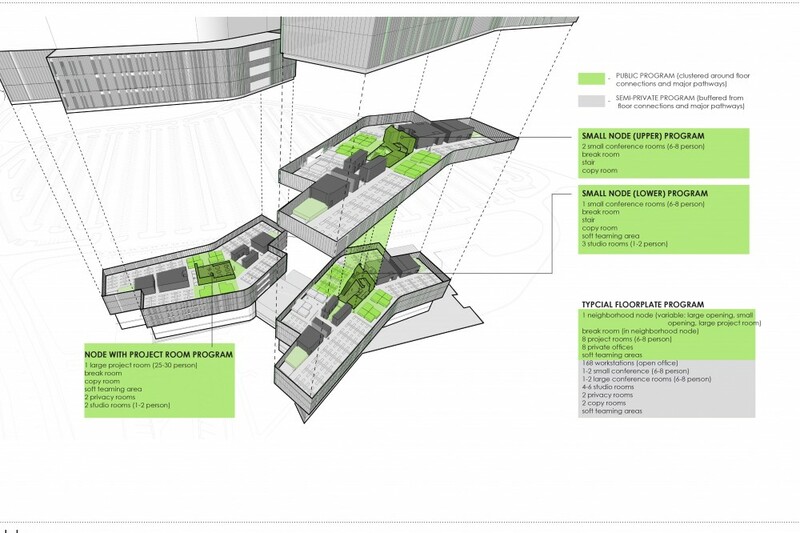 The group focused on both the quantitative (typical square footage allotted to employee, acceptable acoustic and lighting levels, percentages of the floor plate dedicated to individual work or collaborative work…) and qualitative nature of the workplace (ownership and personalization of space, dedicated vs. versatile programming of collaborative space, learning the nature of the end-user, and future-proofing in an ever evolving knowledge economy…) One of the most interesting points of conversation centered around the ability for a space to provide the correct tools to support work and productivity while remaining “hackable” so as not to dictate a routine or pattern for teaming activities. Up next was the San Francisco studio, providing an analysis of beautifully drawn façade studies of recently-built SF residential projects. San Francisco’s city planning and zoning codes create a framework through which one can view the San Francisco façade as an invisible field of grids (bay windows and all). When applying this analysis to recent projects, it became clear that the analysis of an individual project within the field can only be really understood within its larger context. What makes a field of façade uniquely belong to San Francisco? Is it the overhead rhythm of bays as you climb a hill or descend into a valley? Is it the framed view towards the water at almost every street? 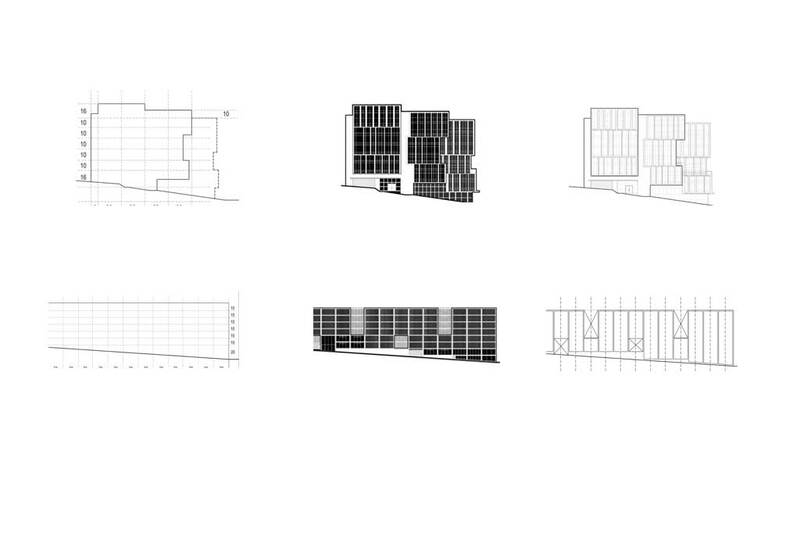 How does the façade relate to its neighbor buildings? The San Francisco studio created a desire in all of us to run home and draw our own cities through a similar lens. New Orleans rounded out the morning with a look at our recently-completed Tulane Yulman Stadium. In the past few months architects in the New Orleans studio have become fluent in graphic language as they place the finishing touches on the wayfinding for the new stadium. The incorporation of a new graphic language, consistent yet flexible enough to accommodate the varied branding of sponsors, was a valuable lesson learned for the project. After lunch, the Lawrence studio drove home the value of strong conceptual thinking with a discussion of Value Engineering (or as they presented the process of re-aligning the key concept of the project to its execution.) 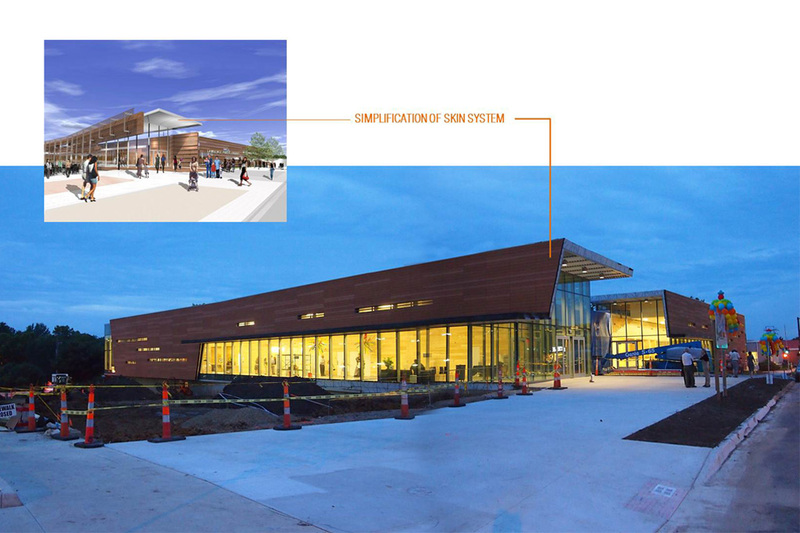 In the project discussed, including the Lawrence Public Library, a strong concept and clear diagram carried the project through typical “stress-tests” (material pricing fluctuations and bidding surprises) to a strong end result. Simplification of early design elements created more easily understood and constructible outcomes, which teaches us the real value of early decision making, drawing with detailing in mind from the outset, and the role of communication within successful projects. 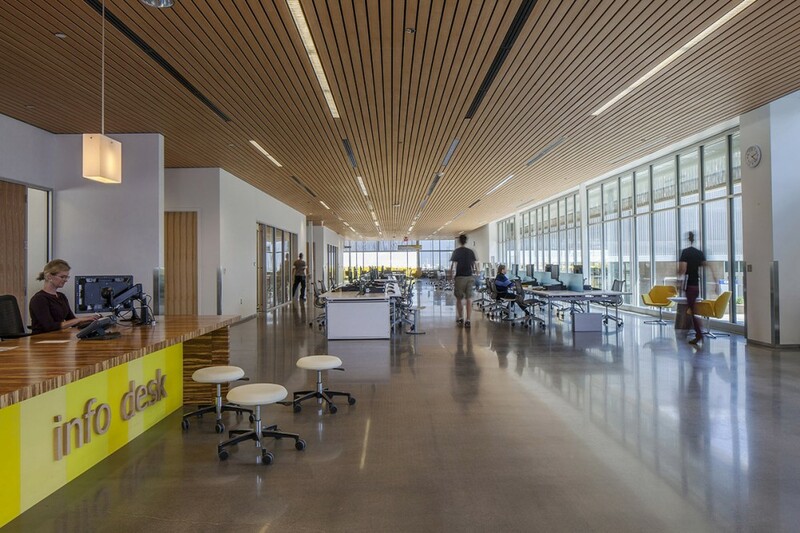 Next, our Phoenix studio premiered their Post-Occupancy Film chronicling the experience of students and teachers in the recently completed Central New Mexico Community College West Side I Building. The building acts as a hub for academic resources for several commuter campuses spread throughout the Albuquerque metro area. The film explored a day in the life of the building occupants, and became a great tool for understanding the variance between the initial design intentions for a space and its ultimate daily use. The interviews in the film were a good reminder for us as designers that designing suggestions for use of space can be much more valuable than designing specifically prescribed use. Our last two presentations involved recent interview experiences. The first detailed the teaming of our Phoenix studio with Canary, our in-house environmental graphics, branding and interiors studio. Teaming with Canary allows our studios the ability to design an experience that extends from the architecture to the smallest branded details. The discussion centered around the value of place-making and designing sometimes within and other times outside of the typical architecture practice to solve a client’s specific design problem. Our Tampa studio in a similar way discussed the need to understand a client’s specific situation and relay that understanding. Benchmarking how others have solved a similar design problem and talking with the user-group of the proposed facility are keys to understanding how to achieve a client’s goals for the project. After a long day of presentations, we felt we’d achieved our goals for the pin-ups: conversations centered around topics and practice, not projects. The group migrated down to Magazine to enjoy some beer, wine, and of course…street tacos! Thanks to all our guests and participants, we’re already sure we’ll have plenty more to discuss next year.